While Italy’s north remains a magnet for tourists, boasting popular destinations such as Milan, Verona, Cinque Terra and Venice, the more secluded south makes for an equally compelling holiday, as recently discovered by London-based Sania Broad, part-time nutritional therapist and full-time mother of 4 children ranging in ages from 9 to 19 years. 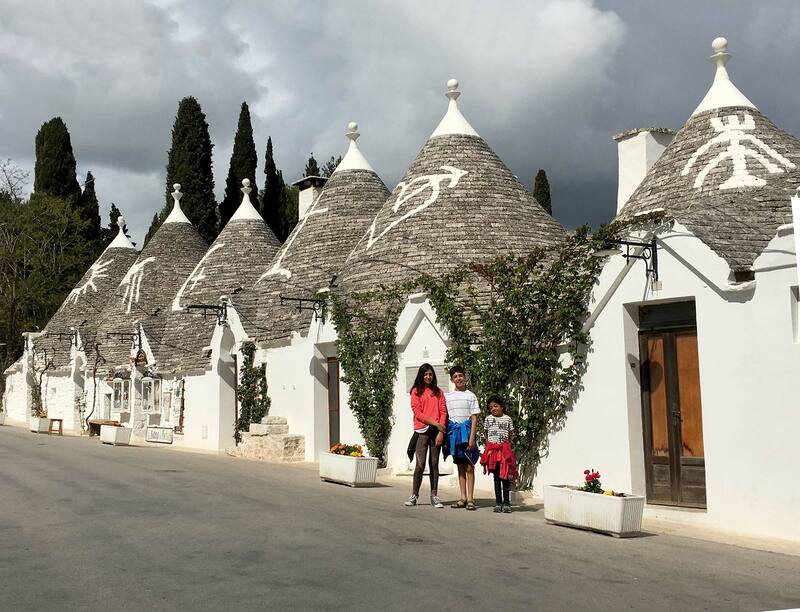 Sania, along with her husband James and three younger children, recently vacationed in Puglia, a picturesque region in the heel of Italy’s boot, characterized by ancient sites, baroque architecture, olive trees and whitewashed towns. 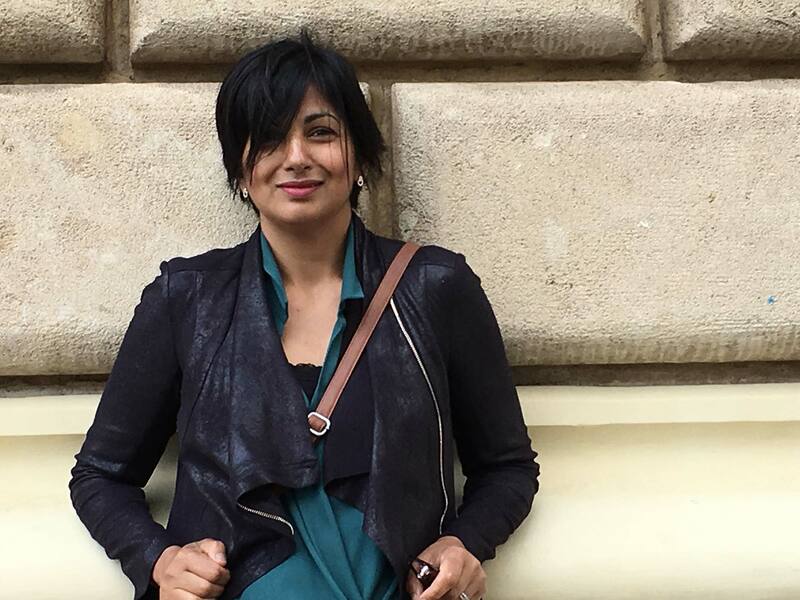 Here she shares her tips for enjoying the rustic charm and rich history of this quintessential Italian coastal area when travelling as a family. We like to discover new places so even though we have loved our previous destinations we rarely visit a place twice. There’s just too much to see and discover! Since I plan our family vacations, I was keen for us to visit somewhere relatively untapped and un-touristy but where we did not feel too alien. I was reliably informed by my Italian friends (there are many settled Europeans in Richmond, London where we live) that Puglia was the ‘real Italy’ and it did not disappoint. This is a beautiful region characterized by the charming ‘trulli’ – stone houses with conical roofs – quite other-worldly, fairy-tale structures. These are set amongst a landscape of rich red earth, dry stone walls, lush green grass and a plethora of olive and pine trees. 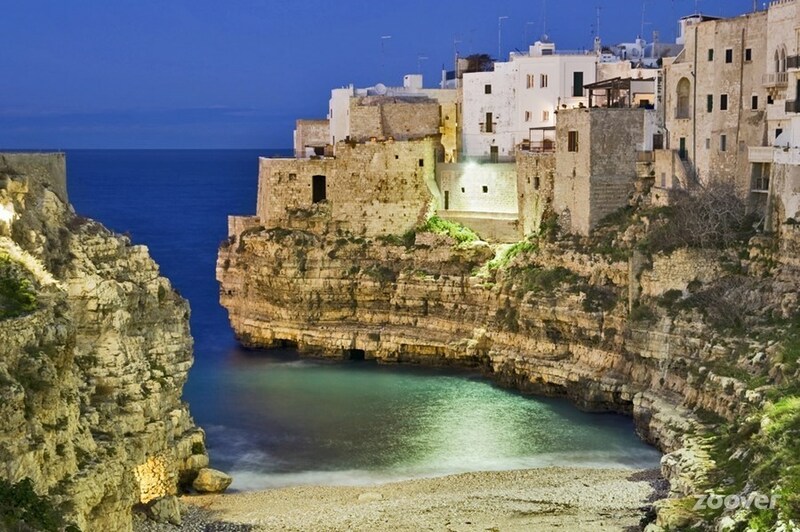 In fact, Puglia is famous for its olive oil and is Italy’s largest producer. In many areas the land is also scattered with wild yellow flowers and red poppies. If you have a car it makes for joyful driving. We were based in a small town called Villa Castelli, close to a larger town Martina Franca which we drove through but didn’t get a chance to visit in any depth. What’s the best way to get to Puglia, and then to travel within it? There are two airports in Puglia; Bari and Brindisi. We flew to Bari from Stansted, UK and picked up a rental car. This was probably our only bad experience of Puglia as we had to wait a good hour and a half to be served. The driving experience very much depends on what you’re used to. Puglia is pretty relaxed and the pace of driving for us was not too difficult at all. There are very few hotheaded drivers on the road and I very rarely heard any honking of horns. The motorways (or really just dual carriageways) from one large town to the next are easy to drive on and present miles of beautiful countryside. Driving within the towns was more challenging, as those tiny narrow streets you identify with Italy really do exist and you understand why the Italians drive small cars! I would definitely recommend hiring a car, especially if travelling with family, for without a car we would have found some of the trips more arduous. Which hotel did you stay at? Would you recommend it to others, especially to families travelling with kids? We stayed in a traditional trullo located between the two seas, Ionian and Adriatic, that I found on Airbnb. The trullo was very much what we had hoped for, with its traditional features. It had a large field at the back that you could explore and the children could even climb onto the trullo roof. It was exceptionally clean and well prepared for our visit. The hosts had kindly stocked the fridge with butter, milk and yoghurts and there was a plentiful supply of bread, biscuits, jams and honey, coffee and tea for breakfast. The owner Vito and his wife Lina made sure we had everything we needed and went above and beyond what we expected of them. It was very child friendly, lots of space to run around and people there do like children so that made it easy! While researching accommodation, we had considered staying at a ‘masseria’ (a working farm), which is another unique way to experience Puglia. 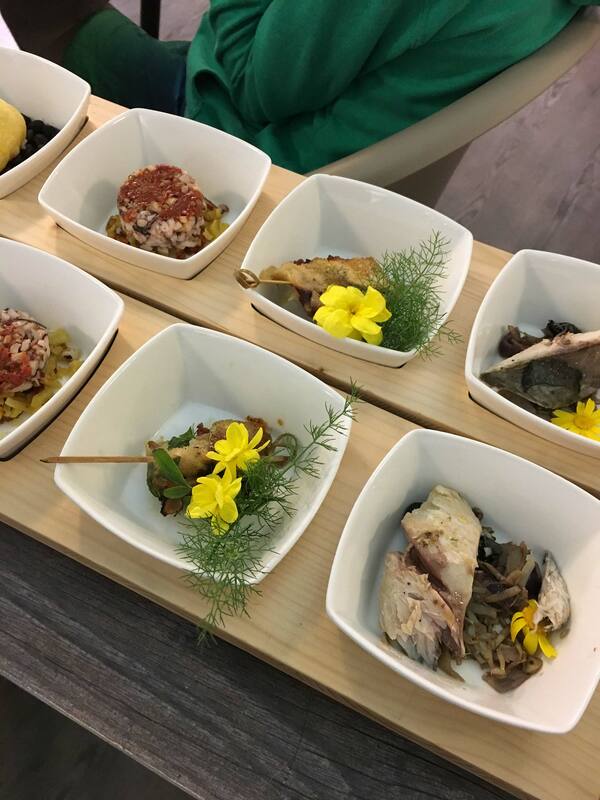 There are many dotted around the region which offer the opportunity to stay with a family and eat with them every evening for a true Italian experience. However, we highly recommend Vito and Lina’s trullo. 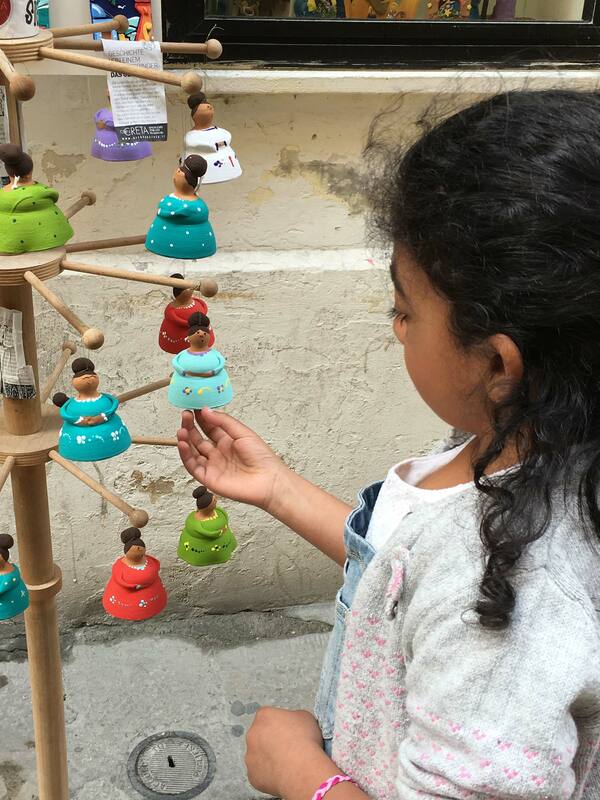 What were your and your children’s first impressions of the city? Is it a kid-friendly place? Where it lacks in the sophistication one might associate with Italy, Puglia more than makes up in charm, friendliness and rustic beauty – a term much used for this region but very apt. The Puglianese are clearly proud of their region, positioned in the heel of Italy’s boot, devoting time to its appearance and cleanliness (we regularly saw residents tending their front gardens and generally, the place is spotless). It was the Easter holidays and we were expecting it to be a little busier than normal but it was really very quiet and had a gentle pace. The children’s first impressions were that it was very pretty. 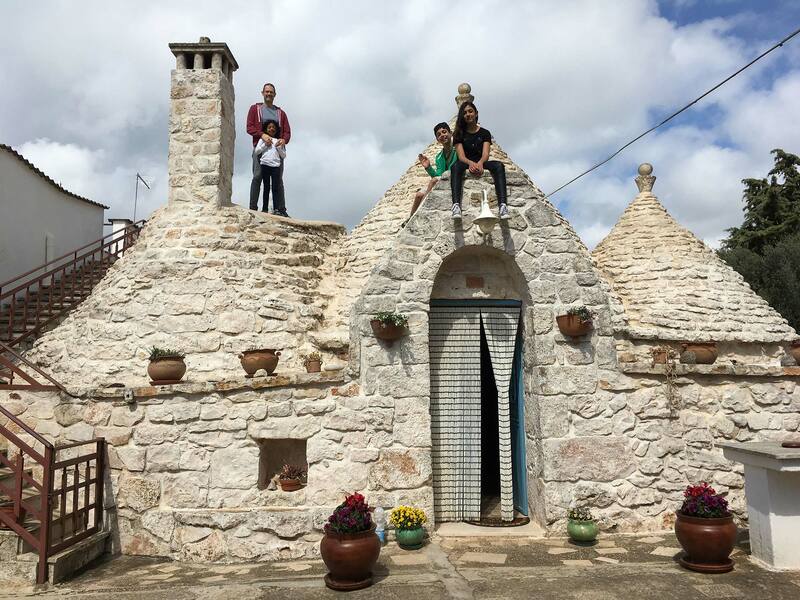 They loved the trullo and the fact that they could climb onto the roof. They loved the food – it was a kid’s paradise with great patisseries, endless gelato shops and of course pizza which is far superior to anything you find in the UK. How do they do that pizza base? The pasta was always fresh and far more dense than the fresh pasta in UK and the kids loved it. They were intrigued by the narrow streets and marvelled at the washing hanging everywhere. They are well-travelled children though so took most things in their stride. Italians are known to be friendly by nature; did it make the experience of travelling as a family more enjoyable? The locals were curious when they first encountered us: as a mixed-race family looking suitably touristy we do stand out, but people were very friendly and more than happy to assist us. There is very little, often no English spoken and we speak no Italian. However, we managed to get by with lots of gesticulating, nodding and shaking of heads, James’ pigeon French and the Collins English/Italian dictionary! The locals have a very relaxed attitude, quite different to the often frenetic London life we lead. They are very child-friendly and loved the ‘bambinos’ as they called them. Italy and especially Puglia, is known for its fantastic food. What are some of the local specialties that you enjoyed? Any restaurant recommendations? We did a mix of eating out and cooking at home. We enjoyed Cibus in Ceglie and also Martinucci in Gallipoli. We loved the snack bars and patisseries in Lecce. We shopped in a local supermarket and bought bread, pasta, cheese, salad, fish and fruit and made a packed lunch on a couple of the days out when we left later than intended so we were guaranteed something to eat (in case restaurants were closed for lunch). We snacked on a biscuit called Taralli which can be sweet or savoury and is common in this region. What’s the trick to packing smart when travelling as a family? Layers! When you can’t guarantee the weather, then lots of layers. Take raincoats and trainers but also sun hats and sun cream! In addition to their clothes, the kids each have a small rucksack which they carry themselves with things to entertain them. I always make sure they have 2 books each (they are complete book worms), pens and drawing pads and anything else they can fit in and and we will take an i-Pad, a pack of cards and a couple of small games such as chess that we can play as a family. I pack enough clothes so that I only have to do one load of washing when I’m there. Try not to do too much. I’m always filling the agenda too heavily and sometimes the holiday can feel like a tick box exercise. It’s good to do your research before you travel (you never know how reliable internet connection will be). I always try to plan the journey and a rough schedule the night before so it’s a more relaxing following day. Plan for wet weather too (for example, we did the caves on an afternoon it was going to rain). In Puglia, everything closes down in the middle of the day for siesta so there’s no point arriving at a destination at midday as it will be closed and you might even struggle to find somewhere to eat. It is also good to have a couple of days where nothing is planned and you can just chill. Tuesday – Visited the local town (Villa Castelli) by foot 20 minutes away. A pretty place with a main square where we had a late lunch. It was colder than we had expected with some scattered showers. 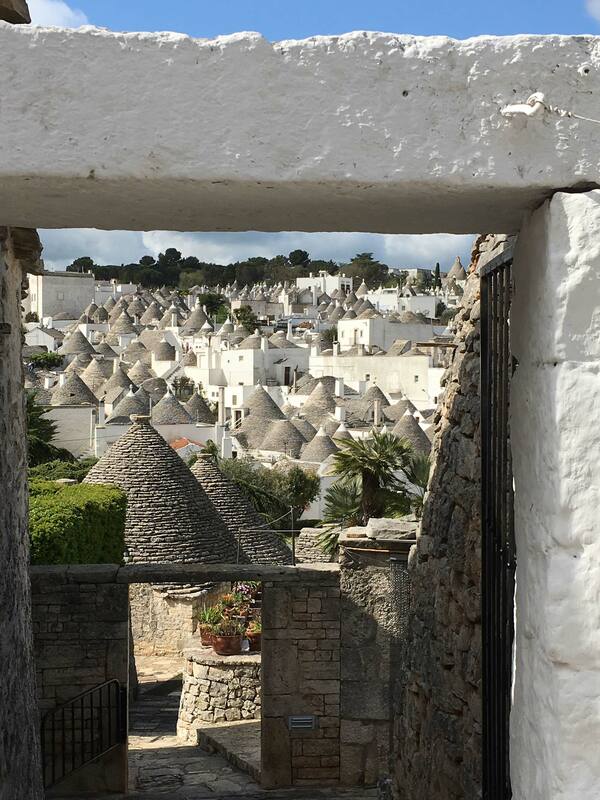 Wednesday – Drove to the picturesque trulli village of Alberobello. This is a tourist hot spot but even then, it was not too busy in April. It’s an enchanting sort of land of the hobbit, or a Star Wars village perhaps. A morning here is enough time. Then drove onto Castellano Grotte – stunning caves which were discovered in the 1930s and are a key natural heritage site in Puglia. Drove back and had dinner at local pizza place in Villa Castelli – excellent pizza! 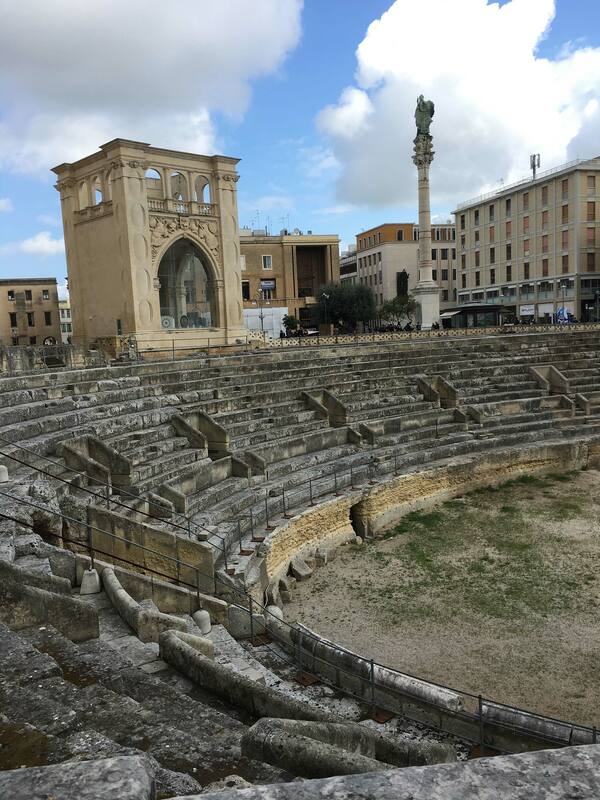 Thursday – Visited Lecce (roughly a 70-minute drive). It’s a city of baroque architecture known as the Florence of the South with a cathedral, amphitheater and lots of great walking sites. One of our favourite things of the day was stopping at random cafés and eateries and snacking on the delicious local delicacies on offer which included slices of excellent pizza, patisseries and delicious gelato (even licorice flavour). Drove to Gallipoli (another 20 minutes’ drive) on the west coast by the Ionian Sea, for the second half of the day. Stopped at the beach, the port and fish market, strolled around the old town and visited the 13th-century fort. 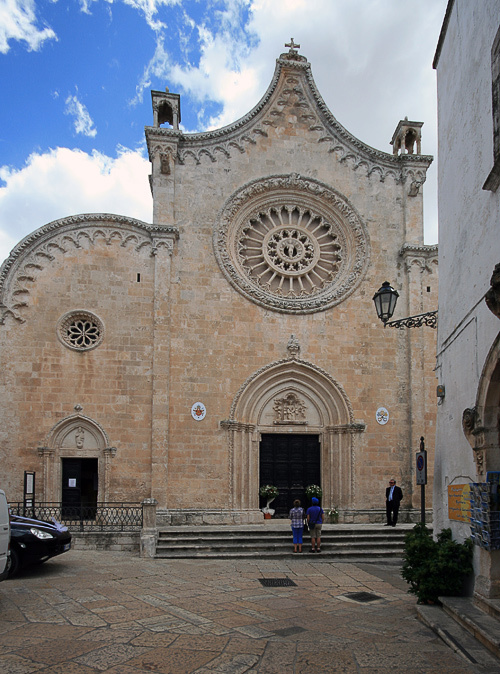 Friday – visited a few of Puglia’s prettiest towns. 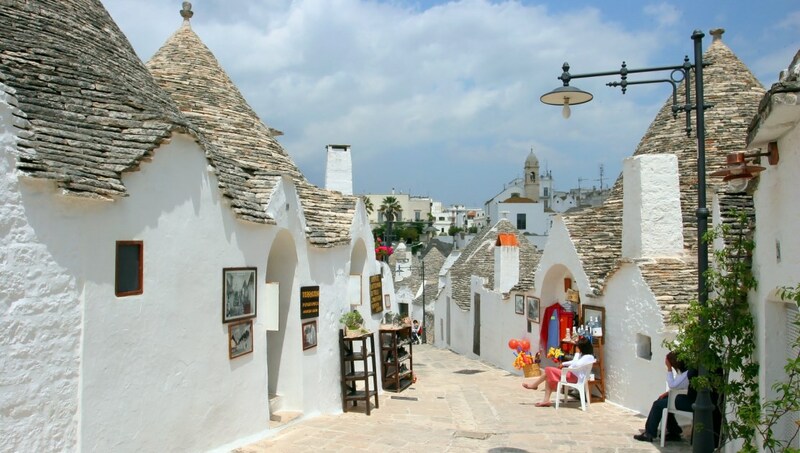 Started with Ostuni, known as the white city, awash with white-ish buildings. Then onto Cisternino and finally Locorotondo. All pretty towns with beautiful churches, where it’s easy to amble around leisurely on a fine day. 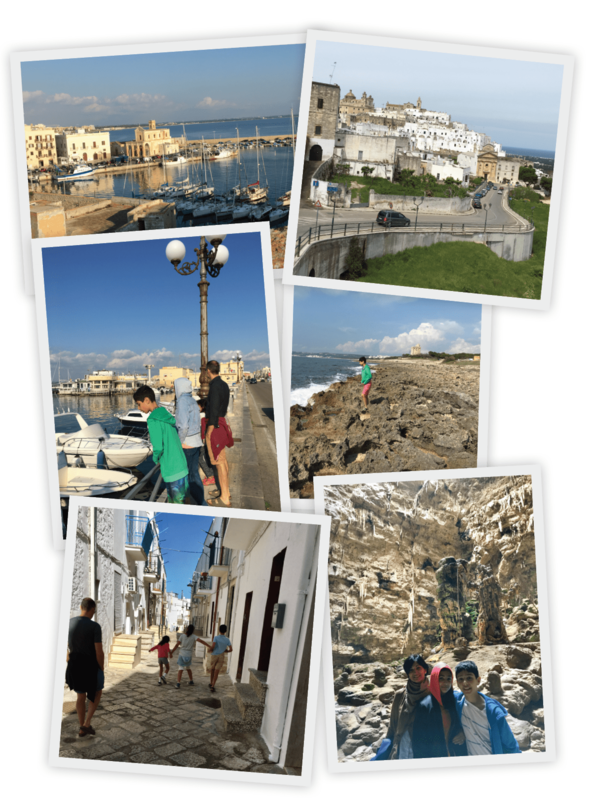 Saturday – Drove to Otranto, a port on the Adriatic Sea on the most eastern point in Italy. It’s beautiful there. Our first stop was the cathedral which has a huge original mosaic covering most of its floor. 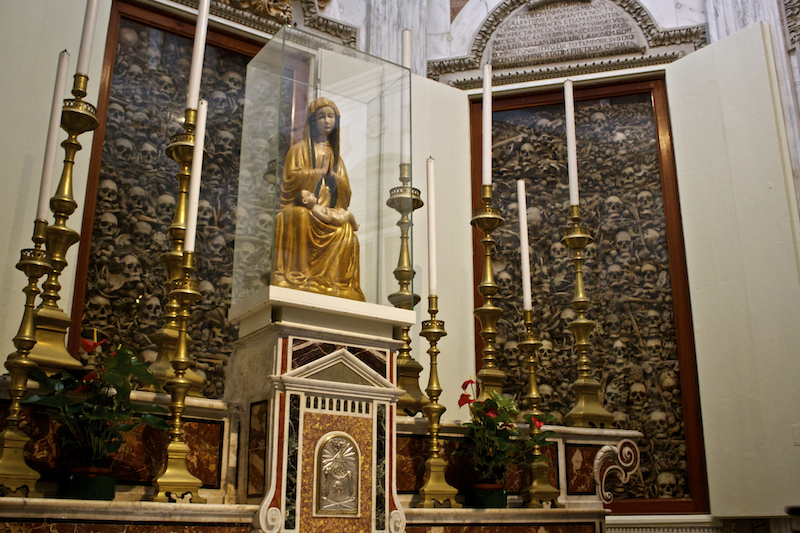 The cathedral’s chapel has another site worth seeing – a glass case filled with 800 human skulls. The story goes that these 800 locals barricaded themselves into the chapel to protest against the conversion to Islam from invading Turks who had crossed the Adriatic in a full-scale attack. We visited the castle/fort, with an excursion into the underground caves. After a lunch of fresh locally-caught fish at a seaside restaurant, we took a lovely walk along the coastline to the lighthouse signifying Italy’s most eastern point. Sunday – Our last full day in Puglia and we had planned to visit Polignane A Mare – a picturesque seaside town recommended by many people. However, the kids were tired and James needed a day off from his heavy driving schedule so we decided to hang out locally. Vito, our Airbnb host, had kindly offered to take us to see a local ancient olive grove so we took him up on the offer. He also took us to a local farmhouse where they made cheese and yoghurt. Monday – we left Villa Castelli for a few days on the Amalfi coast ( a long 5-hour drive), stopping enroute in Matera (just outside the Puglia border) for a few hours. 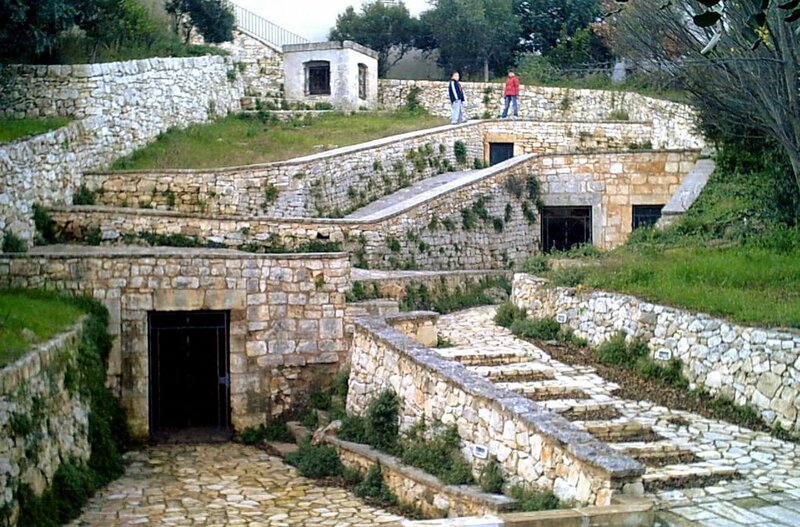 This is a stunning area of historic cave dwellings which were inhabited by the poor as recently as the 1950s. The kids had a map of the town and enjoyed orienteering around the narrow streets to find vantage points for great views of the ‘sassi’ (district). We visited a cave dwelling as it was when it was vacated (the government rehoused everyone in new buildings) and saw how people lived together with their horses and other livestock.